Local governments are improving their failing infrastructure through creative funding and increasing the density of growing communities. Brian Keierleber speaks to groups across America about his innovative techniques to save money on bridge repair in Buchanan County, Iowa. Today, about 10 percent of his county’s bridges are made from converted railroad cars. Some bridges that are torn down are salvaged for their metal and wood planks. As county engineer, he has to figure out how to maintain an infrastructure system in constant need of repair and replacement, while facing a chronic shortage of funds and a mobile public demanding minimal inconvenience. Like Keierleber, many of those involved with managing the nation’s infrastructure struggle with how to keep an aging and overtaxed system operating on a vastly underfunded budget. While attention has largely been focused on efforts nationally, there has been a vigorous effort at the local level to use ingenuity and creativity to make the best of a difficult situation. The Metro system in Washington, DC was forced to shut down for 29 hours in March to repair frayed electrical cables after two fires, one causing a fatality, paralyzed commuters. Lead in supply pipes leached into the water supply for homes in Flint, Mich., last year after the city changed its source of water without adequate treatment. Natural disasters like Hurricane Katrina in 2005 and Superstorm Sandy in 2012 highlighted the devastation from inadequate systems to meet predictable weather events. The I-35 bridge in Minneapolis, Minn., collapsed in 2007, killing 13 people. 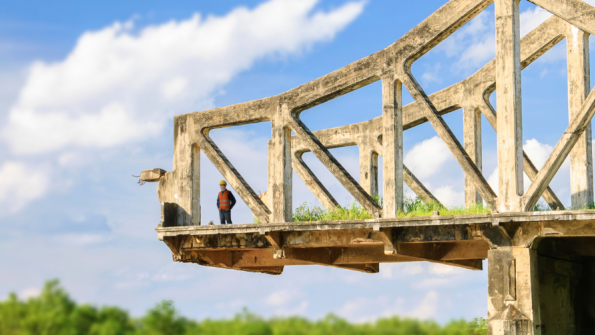 The ASCE estimates that one in nine of the nation’s bridges is rated as structurally deficient, while the average age of the nation’s 607,380 bridges is currently 42 years. Federal infrastructure investment has fallen by half — from 1 percent to 0.5 percent of GDP — over the last 35 years, leaving more of the burden on state and local governments, according to the Center on Budget and Policy Priorities (CBPP), a Washington policy group. For example, federal spending on transportation and water infrastructure has fallen in real terms since 2003, and the federal gas tax has not been increased since 1992. With the current division between Congress and the White House, the prospects for a large increase in expenditures for infrastructure are dim. Both Democratic presidential candidates have promised $1 trillion-plus increases in spending in their campaigns to repair the aging infrastructure, partly as a means to stimulate job growth. The Republican candidates do not refer to infrastructure programs on their websites. Republican leadership in Congress has shown little inclination to increase infrastructure spending, although it did approve a long-term surface transportation bill at the end of 2015 by making cuts in other areas of the budget rather than increasing the gas tax. At the state level, the picture looks just as bleak, according to the CBPP. In the 1990s, when the economy was particularly strong, states and localities increased their investments. However this trend ended after the turn of the century, except for a temporary boost fueled by federal infrastructure funding to states and localities from the 2009 Recovery Act. Spending by state and local governments on all types of capital fell from 2.4 percent of GDP in the early 2000s to 1.9 percent in 2014. Total capital spending as a share of state GDP fell in all but five states and the District of Columbia between 2002 and 2013, with the largest drops in Nevada, Florida and Michigan. These states’ revenues were hit particularly hard by the Great Recession, resulting in cuts in all parts of the budget, especially after the federal Recovery Act funds were depleted. But capital spending has not bounced back in those states — or most others — even as the economy has recovered. Movement toward Smart Growth – Studies have shown that growing communities through greater density reduces the upfront cost for infrastructure by one-third. Trends in the energy industry – The growth of solar and wind power may move power generation from the huge power plant to rooftops and backyards, transforming utilities from generators to distributors and managers of energy. “We’re in the midst of profound changes,” says Marty Rosenberg, editor in chief of Energy Times, an energy industry publication. New materials – Manufacturers are developing new products, like short-span steel bridges, that reduce cost and minimize inconvenience for users. In a number of cities, business improvement districts (BID), which once focused on routine maintenance tasks like trash collection and event marketing, are now taking on substantive projects that may transform cities. In BIDs, a city typically allows property owners and businesses to tax their own businesses so a nonprofit organization can provide more intensive service than a city would provide on a routine basis. In Washington, the Georgetown BID has spearheaded a number of infrastructure projects that venture far beyond routine maintenance. One project now under development would address a key accessibility issue for the neighborhood. The popular retail and restaurant section along the Potomac River has never been connected to the regional Metro subway system. As part of its role, the BID organized $205,000 in funding for the Georgetown-Rosslyn Gondola feasibility study, with public and private sector partners from D.C. and Arlington County. The study is scheduled to be completed by the end of 2016, and if it is ultimately approved and developed, the gondola would connect Georgetown with the Rosslyn Metro station across the river. BIDs in other cities, including Philadelphia and Houston, have been deeply involved beyond the project planning stage. In Houston, for example, the Uptown BID formed a strategic partnership with the Texas Department of Transportation to ensure that a major downtown reconstruction project was managed in a way to minimize the effects on commuters and Uptown residents, workers and visitors. Won a $60,000 Metropolitan Washington Council of Governments grant to study critical roadway issues, to be completed by the end of 2016. Entered into partnership with the National Park Service to create a master plan for the C&O Canal in Georgetown that runs along the river and is a highly used recreational area, and secured funding for major capital improvement projects in the C&O Canal. Successfully piloted six temporary weekend sidewalk widenings on various blocks of M Street over 2014-15, to study improving the pedestrian experience. Won approval for a new canoe and kayak dock in the canal near the 34th Street bridge, which has badly deteriorated from recent storms. Kane, of the Brookings Institution, says that government will rely increasingly on such public-private partnerships, as awareness grows of the strong relationship between infrastructure improvements and economic development. He says that United States can learn from other countries that have long experience in joint projects. In 2012, Bayonne struck a 40-year deal with Bayonne Water Joint Venture, an agreement between United Water Operations and the investment firm Kohlberg Kravis Roberts & Co. to operate the water system in the New Jersey city. Eagle P3 is a project involving the Regional Transportation District (RTD) and Denver Transit Partners in a public-private partnership to develop commuter rail as part of the RTD FasTracks public transportation expansion plan serving the Greater Metropolitan Denver area in Colorado. Virginia HO/T lanes began when Virginia Department of Transportation (VDOT) signed an agreement with Fluor Corporation and Transurban in April 2005 to add toll-based lanes between Springfield and Georgetown Pike. In Georgia, private businesses are expanding their distribution facilities as the state and federal governments prepare to deepen the Savannah River to accommodate more traffic from the Panama Canal at the Savannah River Port. A complementary approach to managing infrastructure is to encourage development that requires less new construction, reducing the upfront building cost and the subsequent maintenance, says Michael Rodriguez, director of research for Smart Growth America, a group that advocates more close-in living. “Our message is that there is a lot of opportunity for government to use land and infrastructure that we invested in in the past,” he says. “We should exploit the investment already in place as opposed to continue to go out to greenfields,” a term for areas that remain free of development. In metropolitan Denver, doubling the persons per square mile could reduce infrastructure costs by 80 percent over a 25-year projection. In Gainesville, Fla., the region could save $100 million over 20 years if the conventional suburban regional scenario was revised from consuming 19.5 square miles to 2.5 square miles over the same period. In New Jersey, a reduction of anywhere from 34 percent to 60 percent in land consumption was estimated to save at least $1.5 billion in infrastructure over 20 years. A Charlotte, N.C. study estimated that the city could save $13 million in upfront capital expenses and $8,4 million a year in operating expenses, if suburban streets connected better, eliminating the need for two fire stations. Despite the evidence that smart growth reduces infrastructure costs, governments on their own will more likely continue to expand to new areas, according to Rodriguez. Instead, government should pursue programs that expand the housing supply in more concentrated areas, making housing affordable and at the same time reducing the need for expensive infrastructure, he says.